Colorado Peak Politics | COLORADO VP RACE: Which Colorado Dem Will Make It on the Ticket? COLORADO VP RACE: Which Colorado Dem Will Make It on the Ticket? On the Dan Caplis Show, the Denver Post‘s owner, Dean Singleton, floated the name of former U.S. 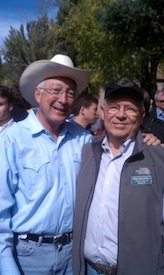 Senator and former Secretary of the Interior Ken Salazar as a vice presidential top pick. Salazar is just the latest of a series of Colorado politicians that liberal political insiders are eyeing. First, it was Governor John Hickenlooper, who was thought to be vying for the position until he offended front runner, Hillary Clinton, in every other sentence. Either he’s toast or that was a brilliant strategic move to align himself with Anyone But Hillary. Word on the street that she is entirely unenthused about a Hillenlooper ticket. But, Hillary is completely under siege right now. So much so that the future of her campaign hangs in the balance, so Hick may have a shot with another candidate. Then, there’s truly embattled Democratic U.S. Senator Michael Bennet who some thought might fail up to the vice presidency so he wouldn’t have to run in his own race where his Democratic base approval is barely above 50% plus one. The speculation around Salazar, while more credible, truly underscores that Colorado is a critical piece of Democrats’ 2016 electoral strategy. Who knows, after the vetting process, the next Colorado elected official up for consideration might even be U.S. Rep. Diana Degette. Just kidding. That would never happen because Democrats love them some good old boys network. They would rather put a failed U.S. Senator in the vice president slot than advance the female Dean of the Colorado delegation. Just remember that, ladies.